For nine days each spring, the most diehard off-road enthusiasts converge on Moab, Utah to test out the latest rugged vehicles on some of the country's most difficult terrain. This off-roader's Mecca, also known as the Moab Easter Jeep Safari, usually features a gaggle of Wrangler-based SUVs. But this year's Jeep Safari will look different. Playing off the buzz around the launch of the 2020 Jeep Gladiator pickup truck, the lineup will exclusively feature six concept pickup trucks, all based on the highly anticipated Gladiator. With the help of Jeep's Performance Parts brand, Mopar, the Gladiator gets injected with even more awesome. Prepare for some serious truck envy. The Jeep Wayout is an Overland concept truck that utilizes the Gladiator's best-in-class payload capacity to create a full-blown camping experience complete with a roof-top tent and canopy. Clad in new Gator Green paint that will be available on the 2020 Gladiator, the Wayout holds a built-in ladder giving you a boost into the rooftop tent which can sleep two under a lighted 270-degree awning. What good would a camper truck be if it doesn't get you somewhere epic? Jeep put this question top of mind when they gave the Wayout a Jeep Performance Parts two-inch lift kit, 17-inch wheels, and 37-inch mud-terrain tires. A Warn Winch and custom snorkel allow the Wayout to navigate any obstacle in its way. Under the hood is a 3.6-liter Pentastar V6 engine with an eight-speed automatic transmission. Drawing inspiration from motocross and desert lifestyle, The Jeep Flatbill is designed to haul all the equipment needed for an adrenaline-spiking adventure. It features a vented carbon hood and high clearance flares along with a shortened front bumper and skid plate for improved approach angles. For the motocross enthusiasts, the bed of this truck comes with a built-in rack with wheel ramps to safely transport dirt bikes. Other customizations include custom bodywork on the bed lowers, the addition of a tube rear bumper for an increased departure angle and a four-inch lift kit to tackle any obstacle in your way. 20-inch wheels are wrapped in 40-inch tires designed for off-road traction. The Flatbill gets a 3.6-liter Pentastar V-6 engine with a cold-air Mopar intake and an eight-speed automatic transmission. Blending retro and modern design beautifully, the Jeep M-715 Five Quarter gets its monicker from pickup trucks of old which were one-and-one-quarter tons (five quarters). This military-style truck is certainly a looker, but that's not all it has going for it. A full carbon fiber front which replaced the Gladiator's sheet metal greets you with the promise of enhanced capability. The Gladiator Rubicon's steel bumper has been modified and added to the Five Quarter for a polished look. Walking around to the back of the truck, you'll find a new 6-foot custom aluminum bed which has been perforated and uses panels and wood slats. From an off-road performance angle, the Five Quarter gets a new heavy-duty suspension system, Dynatrac Pro-rock 60 front axle and a Pro-rock 80 rear axle. The Five Quarter's 20-inch wheels cloaked in statement-making 40-inch tires will take you off the beaten path and beyond. A 6.2-liter supercharged “Hellcrate” HEMI V8 engine gives this beast 700 horsepower. As a throwback to the classic Jeep trucks of the 1970s like the Jeep Honcho, the J6 gets upgraded with Mopar parts for ultimate off-road capability. The Rubicon truck features two doors to maximize cargo space in its 6-foot functional bed box. With 12 more inches than the production Jeep Gladiator, the J6 will stash and haul all your outdoor toys. A steel prototype roll bar has four five-inch Performance Parts LED lights giving you easier access to your gear even once the sun sets. 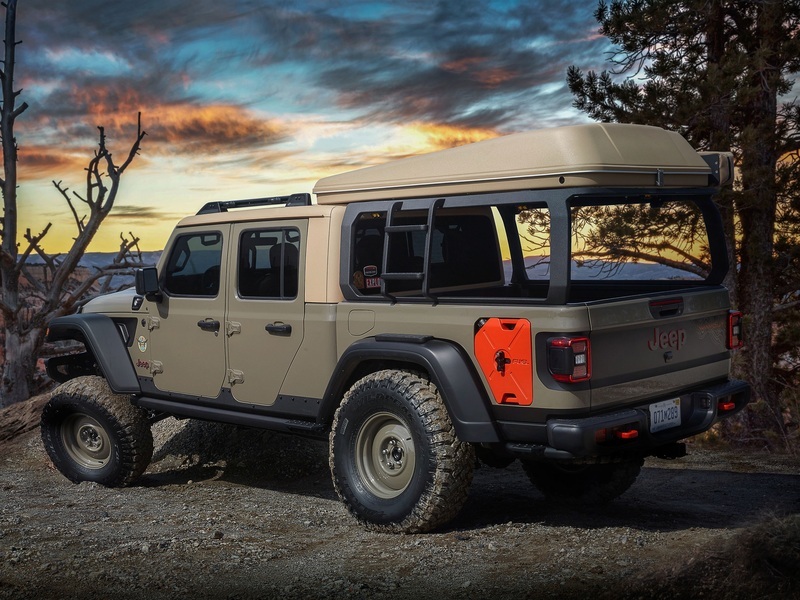 Additional modifications include a prototype steel stinger bar that bolts to the front bumper and rock rails with two-inch steel tubes attached to the standard Jeep Gladiator rails. Just like the Gladiator, the hardtop can be removed for open-air off-roading. The 17-inch beadlock wheels on the J6 feature a deep dish design and come with 37-inch off-road tires. The standard 3.6-liter engine is upgraded thanks to the Jeep Performance Parts cold-air intake. Featuring what is perhaps the most familiar name from Jeep's pickup trucks of yesteryear, the Jeep JT Scrambler arrives at the Easter Jeep Safari looking the part with the retro-inspired color pallet. Looking at the JT Scrambler will send you right back to the 1980s and remind you of the original CJ Scrambler, with prototype metallic orange paint and Nacho body-side stripes that travel from the front panels all the way to the bed. The top of the while truck gets a vintage amber to really throw you back in time. The customized truck bed in the JT Scrambler offers a two-inch steel, prototype tube sport/roll bar painted body-color white. It extends the length of the bed rails on each side, offering a total of eight tie-down points to lock down cargo. 17-inch wheels from Jeep Performance Parts get the bronze treatment to match the exterior and are equipped with 37-inch tires. The Scrambler's 3.6-liter engine gets a performance boost from a Mopar cold-air intake and cat-back exhaust. Last but not least, is Jeep's ultimate rock crawler, the Jeep Gravity. Inspired by rock climbers of the human variety, the eye-catching Punk'N Metallic Orange paint job is just as daring as those that will be driving this truck on some steep terrain and then getting out to scale it themselves. For the fearless among us, the mounted cross rails in the bed along with a cargo carrier offer up storage for rock-climbing gear. One feature unique to the 2020 Jeep Gladiator is the ability to experience true open-air driving in a pickup truck. The Gladiator Gravity sports two-inch round steel tube doors, a mesh sunbonnet and tie-down straps that will keep the windshield secure when it's lowered. Other Jeep Performance Parts customizations include a two-inch lift kit, heavy gauge steel rock rails, and a Mopar satin black grille. An improved engine with cold-air intake and cat-back exhaust system rounds out the capability upgrades for this ticked out Jeep Gladiator.